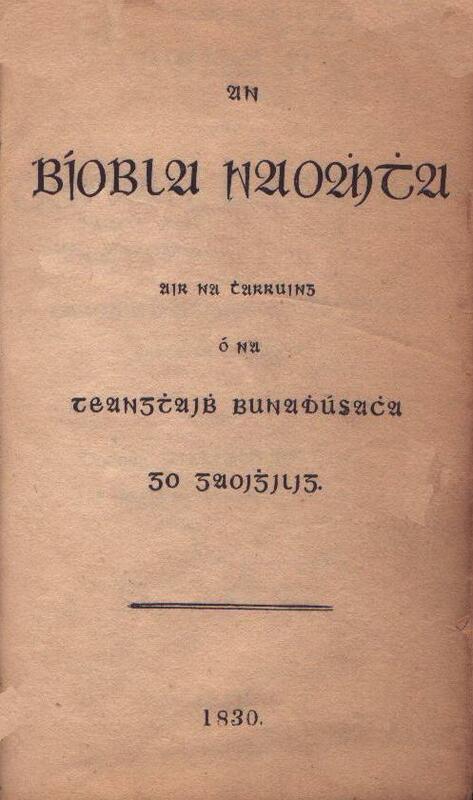 Title [The Holy Bible] An / Biobla Naomhtha / air na tharruing / o na / teangthaibh bunadhusacha / go gaoighilig / 1830. Publisher Goodwin, Son & Nethercott, Dublin [Hibernian Bible Society]. Contents Bible in the Bedel/Walsh Version edited by a Catholic scholar, Edward O'Reilly, for the Hibernian Bible Society. Does not include the Deuterocanonical Books. Small size (6" x 4") printed in a tiny size type with letters in the Irish alphabet. Includes separate title pages for the Old Testament (Tscan Tiomna) and the New Testament (Tiomna Nuadh). A note in English on the verso of the OT title page says, "The Words at the bottom of the Pages exhibit the Readings of the Quarto Edition of 1681-5." TitleAn Irish Translation / of / The Book of Genesis / from the Latin Vulgate. / with / A Corresponding English Version, / Chiefly from the Douay. / Accompanied with Notes, from the Most Distinguished Commentators. / To Be Followed by That of the Other Books, in Successive Parts, / to the Close of the Inspired Writings. / by / The Most Rev. John MacHale, / Archbishop of Tuam. / Published in Tuam. / Sold by James Duffy, 7, Wellington-Quay, Dublin. / 1859. Comments No further portions of the Bible ever appeared from this series.